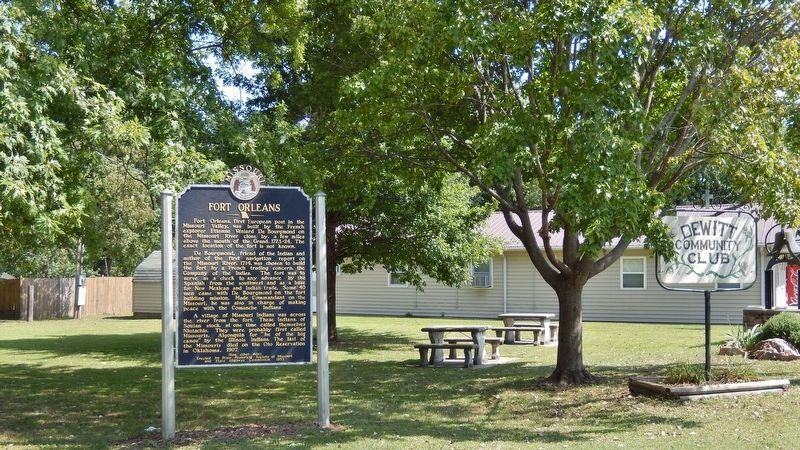 Fort Orleans, first European post in the Missouri Valley, was built by the French explorer Etienne Véniard De Bourgmond on the Missouri River close by, a few miles above the mouth of the Grand, 1723-24. The exact location of the fort is not known. 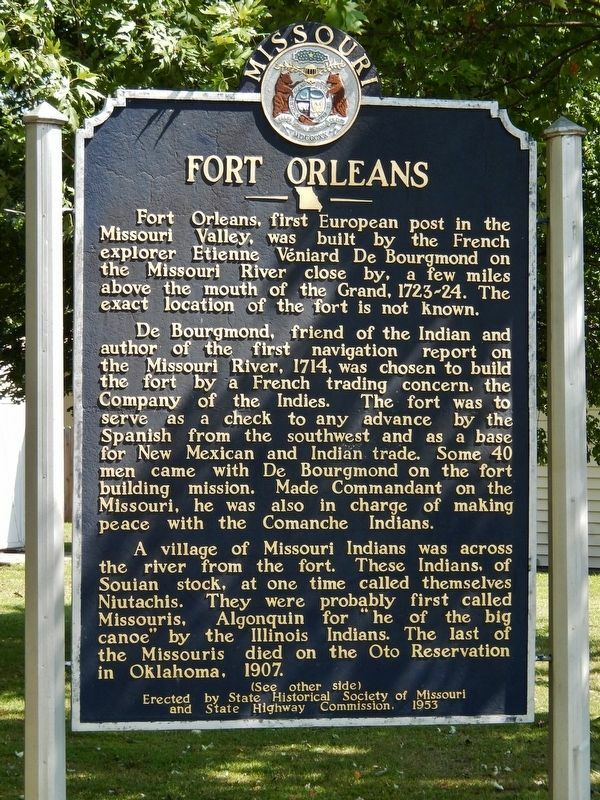 De Bourgmond, friend of the Indian and author of the first navigation report on the Missouri River, 1714, was chosen to build the fort by a French trading concern, The Company of the Indies. The fort was to serve as a check to any advance by the Spanish from the southwest and as a base for New Mexican and Indian trade. Some 40 men came with De Bourgmond on the fort building mission. Made Commandant on the Missouri, he was also in charge of making peace with the Comanche Indians. 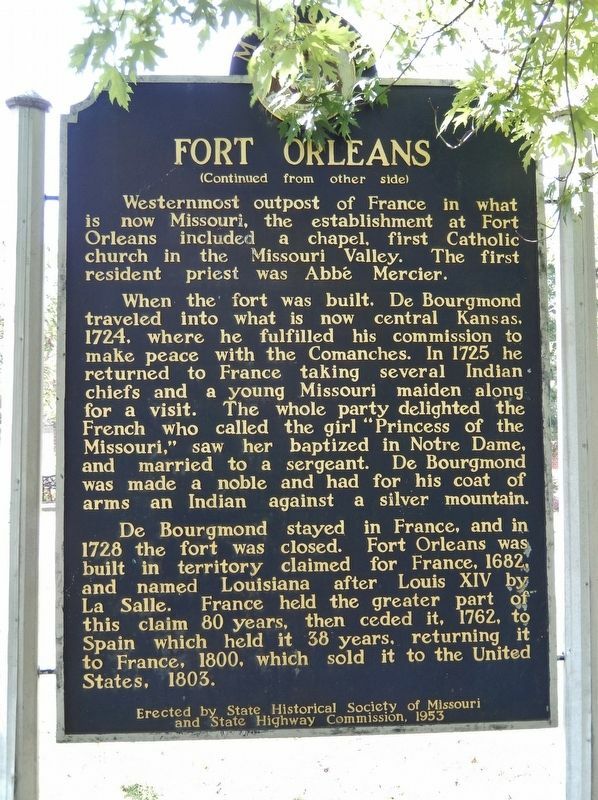 from other side) Westernmost outpost of France in what is now Missouri, the establishment at Fort Orleans included a chapel, first Catholic church in the Missouri Valley. The first resident priest was Abbé Mercier. When the fort was built, De Bourgmond traveled into what is now central Kansas, 1724, where he fulfilled his commission to make peace with the Comanches. In 1725 he returned to France taking several Indian chiefs and a young Missouri maiden along for a visit. The whole party delighted the French who called the girl "Princess of the Missouri," saw her baptized in Notre Dame, and married to a sergeant. De Bourgmond was made a noble and had for his coat of arms an Indian against a silver mountain. De Bourgmond stayed in France, and in 1728 the fort was closed. Fort Orleans was built in territory claimed for France, 1682, and named Louisiana after Louis XIV by La Salle. France held the greater part of this claim for 80 years, then ceded it, 1762, to Spain which held it 38 years, returning it to France, 1800, which sold it to the United States, 1803. Erected 1953 by State Historical Society of Missouri, and Missouri State Highway Commission. This marker is included in the Missouri, State Historical Society of marker series. Location. 39° 23.075′ N, 93° 13.291′ W. Marker is in De Witt, Missouri, in Carroll County. Marker is at the intersection of Jefferson Street and 7th Street, on the right when traveling west on Jefferson Street. Touch for map. Marker is located in De Witt Community Park, near the southwest corner of the park. Marker is in this post office area: De Witt MO 64639, United States of America. Touch for directions. More about this marker. Marker was originally in a roadside park on US Highway 24, about 1.5 miles northeast of De Witt, but was moved to its current location in De Witt Community Park sometime before 2015. Credits. This page was last revised on April 11, 2019. This page originally submitted on April 10, 2019, by Cosmos Mariner of Cape Canaveral, Florida. This page has been viewed 116 times since then. Photos: 1, 2, 3. submitted on April 10, 2019, by Cosmos Mariner of Cape Canaveral, Florida.